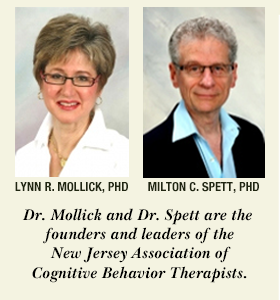 The article is adapted from the workshop "CBT for Low Self-Esteem," presented by Dr. Spett at a conference of the New Jersey Psychological Association. Low self-esteem is a pervasive psychological dysfunction – regardless of their specific presenting problems, virtually all patients state that they would like to have better self-esteem, and low self-esteem is one cause of their presenting problem. If we just alleviate low self-esteem, many psychological problems will diminish substantially or disappear completely. But the most powerful approach to treating psychological problems is to treat both low self-esteem and the patient's specific psychological disorder. The opposite of low self-esteem is not "high self-esteem" or "good self-esteem." These terms suggest that in order to feel good about themselves, patients must believe that they are very competent or successful, and people who do not feel this way are doomed to suffer from low self-esteem. Furthermore, "high self-esteem" and "low self-esteem" both imply self-judging, another psychological dysfunction. I believe that "self-acceptance" is the term which best describes the opposite of low self-esteem. "Self-acceptance" means not judging yourself either well or poorly, just knowing yourself and being comfortable with who you are. So the goal of therapy with low self-esteem patients is not "high self-esteem" or "good self esteem" – it is self-acceptance. Self-acceptance has two major components: (1) recognizing and enjoying your strengths and successes; and (2) recognizing, being comfortable with, and not berating yourself for weaknesses, mistakes, and failures. "Self-acceptance" is not incompatible with trying to do better. Patients can accept themselves as they are right now and still strive to be more competent and successful in the future. Low self-esteem is too general a concept to be addressed in psychotherapy. We all loved Mr. Rogers when he told us that we are perfect just the way we are, but this type of affirmation has no permanent effect on low self-esteem. Instead, low self-esteem must be broken down into its components, and we must identify and alleviate each patient's low self-esteem components. In addition, low self-esteem is situation specific – no one has low self-esteem in every situation. A patient can experience severe low self-esteem in interpersonal situations, yet be perfectly confident in work situations. 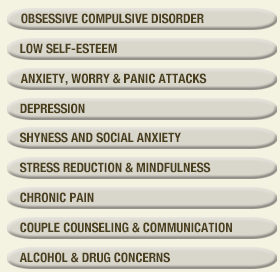 So we therapists must identify and treat each patient's low self-esteem in each specific situation. 1. Help patients stop criticizing themselves unfairly. Each week ask patients "When did you criticize yourself this week?" If the self-criticism was unwarranted, point this out to the patient. 2. Help patients accept their real weaknesses, mistakes, and failures. If the self-criticisms were warranted, encourage patients to objectively evaluate the consequences of their weaknesses, mistakes, and failures. The consequences are almost always negligible or non-existent. Help patients to stop berating themselves by asking them "What is the harm in that mistake?" Usually the only harm is their berating themselves. And patients can stop berating themselves and still exhibit weaknesses, mistakes, and failures. 3. Criticisms from others. Each week, ask patients about criticisms they have received from others. If patients believed erroneous criticisms, point out that the criticisms were erroneous. If the criticisms were valid, help patients to accept the criticisms without berating themselves. 4. Question patients' reports of being criticized. Ask exactly what the other person said. If the patient misinterpreted a neutral comment as a criticism, correct that misinterpretation. I have occasionally asked a patient to repeat exactly what was said and found that the patient had actually misinterpreted a compliment as a criticism. If a perceived criticism is ambiguous, suggest that your patient ask the other person if the remark was a criticism. 5. Help patients recognize, believe, and enjoy compliments. Low self-esteem patients often fail to recognize compliments, denigrate compliments, and/or quickly forget compliments. 6. Accepting conflicting opinions. Encourage patients to listen to others who disagree with them, and express their views without feeling inferior or that they have to convince others that they are right. 1. Help patients stop believing they have failed when they haven't. Low self-esteem patients tend to experience successes as neutral events, experience neutral events as failures, and experience failures as catastrophes. I once treated a low self-esteem patient who came in every week and told me that he was about to be fired because of all the mistakes he was making. He had no family, little money, and if he lost his job, he would have become destitute. I found seeing him so stressful that I would take two aspirins before his session. Then one day he came in and told me that he had received a promotion and a raise. Since then I have always been skeptical when low self-esteem patients report mistakes, failures, and impending doom. Now I always ask for details. 2. Help patients give themselves credit for their successes. Low self-esteem patients tend to attribute success to luck or to the ease of the task or to the inadequacy of the competition or to anything but their own competence. When low self-esteem patients do admit to a success, frequently remind them of their success and help them to enjoy the success. Encourage these patients to stop spending 90% of their time thinking about the 10% of their lives that is not going well. Ask low self-esteem patients to make a "Success List," a list of their successes, and a "Positive Qualities List," a list of their positive qualities, including their skills. Discuss these lists frequently with them, and ask them to add additional positive qualities and successes as they occur or become apparent. Low self-esteem patients will often forget their successes, so you should question them carefully about events in their lives, point out their successes and positive qualities, and ask them to add these items to their "Success List" and their "Positive Qualities List." You can also ask them to write an essay describing their successes and positive qualities as if they were giving a speech honoring themselves. 3. Convince low self-esteem patients to stop comparing themselves to others and stop experiencing activities as tests of their worth. Help these patients stop comparing themselves to others, especially others who are better than they at some endeavor. Some individuals are better than other individuals at some things, but no one is a better person than anyone else. Comparing oneself to others is meaningless and counterproductive – patients should simply try to do the best they can, enjoy their successes and positive qualities, and not berate themselves for their weaknesses, mistakes and failures. One patient was overwhelmed with feelings of worthlessness whenever he visited a friend who had gone to Harvard. The fact that the patient didn't go to Harvard did not mean that he was inferior to his friend. It just meant that the friend was more successful academically. A reasonable amount of success helps patients to maintain self-acceptance. Many patients have skill deficits and need skill training. Of course the therapist must have the skill to teach it to patients. 1. Avoidance and skill deficits are reciprocal causes of each other. Low self-esteem causes patients to avoid situations which may evoke their feelings of inadequacy. But avoiding these situations prevents patients from developing skills which will help them achieve success and self-acceptance. Tell patients "The only way to develop skill is to practice. And even the most skillful person was once a beginner." One patient who was already socially isolated told me he was dropping out of his bowling league because he was the worst bowler in the league. I responded that if everyone felt that way, no one would ever bowl in a league. If the worst bowler dropped out, then the next worst bowler would become the worst, and he would drop out, and so on until no one was left. The patient laughed and agreed to continue bowling. Eventually he came to enjoy the bowling and the socializing even though he remained a poor bowler. 2. Help low self-esteem patients to be open about their weaknesses, mistakes, and failures. When patients hide weaknesses, mistakes, and failures, this intensifies their feelings of shame and low self-esteem. In addition, when patients ask another person for help or tell another person about a weakness, mistake, or failure, the listener almost always responds that the weakness, mistake or failure is not nearly so dire as the patient believes. Often listeners offer information about their own weaknesses, mistakes and failures. Every one of my patients who shared a weakness, mistake, or failure with a friend reported that he or she felt better afterward. 3. Convince low self-esteem patients to stop trying to be and say what they think others want them to be and say. If patients are constantly censoring themselves or trying to be something they are not, they will perform much more poorly and create the very failures they fear. Encourage these patients to be themselves, and let others like or dislike them as they are. The more patients try to be and to say what others want, the more patients will feel that they are inadequate as they are. In addition, rejection and criticisms provide opportunities for low self-esteem patients to practice accepting themselves when others don't. Of course there are exceptions to every guideline. There are benefits to appearing to be what a patient's boss wants that patient to be. 1. Identify all of the patient's low self-esteem components. 2. Every session, ask about specific situations which recently evoked the patient's low self-esteem. Then help patients enjoy their strengths and successes, accept weaknesses, mistakes, and failures, and correct invalid criticisms and misperceptions of weaknesses, mistakes, and failures. 3. Every session, express general self-acceptance cognitions, aphorisms, and examples to replace the patient's low self-esteem components with self-acceptance. 4. Ask patients to imagine upcoming situations that may evoke their low self-esteem components. Have patients prepare and rehearse self-acceptance cognitions they can use in these situations. 5. Ask low self-esteem patients to stop avoiding and do whatever they would do if they accepted themselves. This means testing out their low self-esteem cognitions and almost always proving them to be erroneous. 6. In order to reinforce progress, frequently ask about specific situations which now evoke self-acceptance but used to evoke low self-esteem feelings and cognitions. 7. These steps must be repeated many times. Each repetition strengthens self-acceptance and weakens low self-esteem emotions and cognitions. Finally: You have to have a self before you can accept yourself. Having a self means being clear about your beliefs, emotions, likes, dislikes, values, goals, etc. Having a stable self means not feeling good about yourself after every success or compliment, and not feeling bad about yourself after every mistake or criticism. If a patient does not have a stable self, therapy must focus on developing a self before working on self-acceptance.